The E31 head was used on the 1970 and 1971 Model Year Z's. There are at least two E88 heads. One was used on the 1972 Model Year Z's and the other was used on the 1973 240Z and the 1974 260Z. For performance applications the 1972 E88 is considered a better design, thus yeilding better flow than the later E88's. 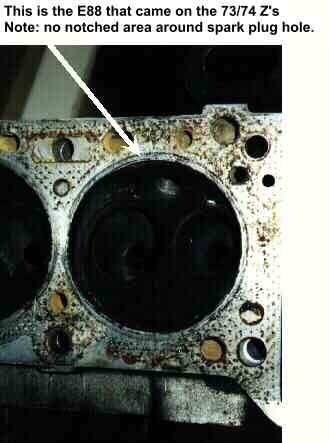 You can spot the E31 and early E88 heads because they have a distinct notched area just to one side of the spark plug hole. The later E88's lack this notched area and are smooth on both sides. See the pictures belolw.